The Meigs High School Drama Club will present “Guys and Dolls” during two shows this weekend. 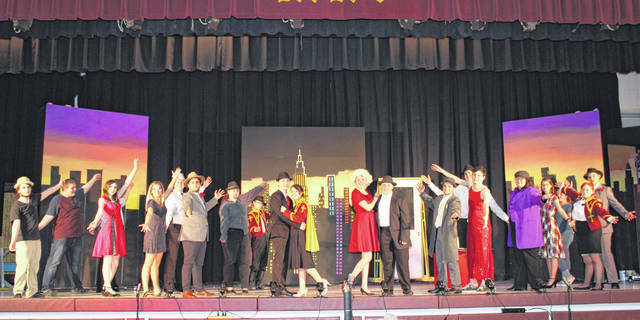 ROCKSPRINGS — The Meigs High School Drama Club will present the Broadway classic “Guys and Dolls” this weekend. Shows are set for 7 p.m. on Friday, April 12 and Saturday, April 13 in the Meigs High School gymnasium. Considered by many to be the perfect musical comedy, Guys and Dolls ran for 1,200 performances when it opened on Broadway in 1950, according to Music Theatre International. It received nearly unanimous positive reviews from critics and won a bevy of awards, including Tony Awards, Drama Desks and Oliviers. The Broadway play then became a movie in 1955 staring Frank Sinatra and Marlon Brando. “All the hot gamblers are in town, and they’re all depending on Nathan Detroit to set up this week’s incarnation of ‘The Oldest Established Permanent Floating Crap Game in New York’; the only problem is, he needs $1000 to get the place. Throw in Sarah Brown, who’s short on sinners at the mission she runs; Sky Masterson, who accepts Nathan’s $1000 bet that he can’t get Sarah Brown to go with him to Havana; Miss Adelaide, who wants Nathan to marry her; Police Lieutenant Brannigan, who always seems to appear at the wrong time; and the music/lyrics of Frank Loesser, and you’ve got quite a musical,” states the story line described by IMDb. Guys and Dolls features several well known songs, including “Luck Be a Lady”, “Sit Down, You’re Rocking the Boat”, and “A Bushel and a Peck”. Cast and Crew include, Aaliyah Tobin, Graci Riffle, Mikayla Schwendeman, Hannah Ridenour, Shayla Mayes, Madeline Shope, Gus Kennedy, Sky Green, Devon Erwin, Gavin Harder, Noah Anderson, Caden Morrison, Ezra Briles, Emily Pullins, Tamika Ramage, Brycen Smith, Austin Mahr, Bobby Musser, Eli Leigh, Alexis Medley, Chase Jones, Brody Reynolds, Brian Ackley, Noah Kimes, Alyssa Leib, Alaina Scarberry, Logan Caldwell, Josie Donohue, Samantha Eblin, Jasmine Connolly, Evan Hennington, Jenna Marshall, Cameron Davis, Hayley Lathey, Mollee Buskirk, and Abbie Barrett. Admission is $5 and concessions will be available. https://www.mydailysentinel.com/wp-content/uploads/sites/14/2019/04/web1_4.10-MHS-Play_ne201949145317382.jpgThe Meigs High School Drama Club will present “Guys and Dolls” during two shows this weekend.